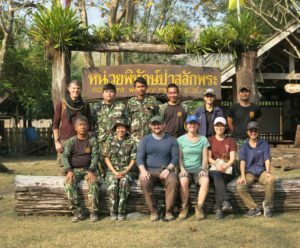 For three weeks in January, I escaped the New York winter and traveled to hot and humid Thailand to start a project observing wild elephants in and around Salakpra Wildlife Sanctuary. Through a mixture of hours in the forest, drives through agricultural areas, and numerous visits to shopping malls for supplies, I learned a lot about the many logistics involved in setting up a new field site. The whirlwind of a trip though was well worth it, as our project is finally ready to begin – or as described by my new favorite Thai words, it is riiap raawy! Our team for this trip consisted of myself, Dr. Plotnik, our two Thai research assistants, Ju and Wow, and a researcher we were consulting who had experience in Salakpra and the surrounding agricultural areas, Alex Godfrey. We began our trip by piling the five of us into our (somewhat) trusty research vehicle, which we named E’ Som (Thai for her bright orange color), and travelled to different areas in Kanchanaburi. We met with government officials to retrieve our research permits, the chief of Salakpra to discuss the details of our plans, and local collaborators to determine which areas we would investigate as potential observation sites. We then spent far too long viewing house rentals with questionable décor until we found a house to serve as our research station. 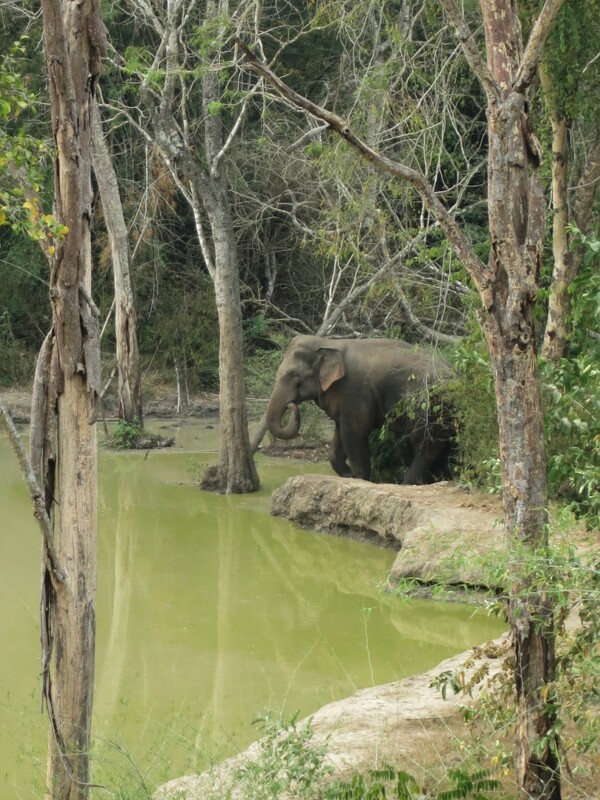 Our first trip into Salakpra sanctuary itself was to Khao Seua, a ranger station 10 km into the forest, where we planned to investigate the nearby artificial watering holes as potential observation locations. Trips through the forest consisted of our team and several rangers crowded into a pickup truck, bouncing past thick bamboo and avoiding branches across the road. It was exhilarating to listen to the sounds of the forest and snippets of conversation in Thai that blew past me as we headed to each destination. At the largest watering hole near the ranger station, we checked out the view from a permanent observation tower that had been constructed by the sanctuary officials. As we were looking out on the water, a bull elephant ambled into sight at the edge of the watering hole. This was actually my first encounter with a wild Asian elephant. And to watch him drink, wade into the water, and eat some of the mineral-rich clay at the bottom of the pond, was very exciting. They even granted me the honor of naming this first identified elephant of our project, and so I decided to dub him after the wise wizard he resembled, Albus. That night we staked out the observation tower again to test out our new low light camera equipment for spotting elephants. Everyone’s ears were perked to the sounds of breaking bamboo and the intermittent chirps and trumpets of elephants in the distance. We were lucky enough to see two more lone bulls that night, illuminated by the half moon. However, the family groups we could hear in the distance didn’t grace us with their presence. In total we traveled to four different ranger stations over the course of a week and met rangers who all had stories of the elephants that came near their stations – one elephant had even broken into a refrigerator for jackfruit! We also explored the edges of the protected area in the agricultural communities where farmers described fending off elephants who come to snack on their sugar cane, corn, and cassava. We saw many of the farmer’s deterrent strategies including electric fences, trip wires for fireworks, trenches, electric lights, and firecrackers to throw and scare elephants away. We also observed some of the destruction these farmers were trying to avoid, both of their crops and buildings. 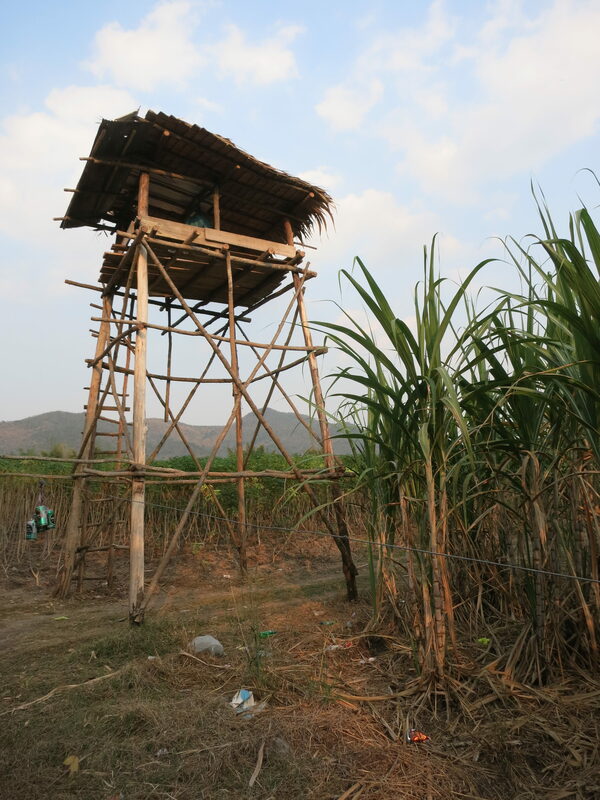 A few of the communities had already built bamboo watchtowers where people were stationed all night so they could drive any marauding elephants away. 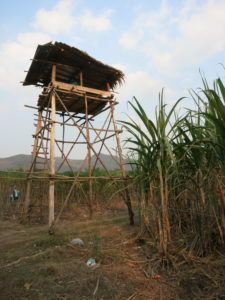 We spent one night in a tower like this waiting in anticipation of elephants, scanning the sugarcane field for signs of disturbance and listening for breaking branches. But all we listened to that night was the crackling of the nearby crop harvest burning, a technique farmers use in the area to recycle nutrients for the next planting. The tall sugarcane around us ready to be harvested remained unscathed for the night. In addition to laying the groundwork for our behavioral observation research, we also prepared the first aspect of our cognition research by designing novel puzzle boxes that will be set up in Salakpra for the elephants. This meant our team of biologists and psychologists spent several days in the office flexing our latent engineering skills, attempting to build a physical model of the box from my initial theoretical brainstorms and drawings. After many discussions and revisions of its mechanics, we completed a partially functional 3D model out of plastic board, which was pretty impressive to me! The next step was to show a local metal engineer our handiwork and see if they would be able to build it to be elephant-proof. Unfortunately, I had to depart before they could complete the unique challenge, but I look forward to seeing the final product in the weeks to come! 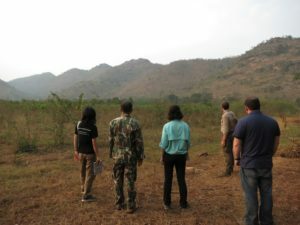 Our overall tour of areas in and around Salakpra sanctuary served to provide us with critical information about where we want to build new observation towers, connect our team with the communities we will be working with, and help us develop protocols for observing the elephants there. It was an exhausting, exciting, and informative three weeks. And the only injury our team suffered was E’ Som’s bamboo skewered flat tire. So I count it a pretty good start for a field project! 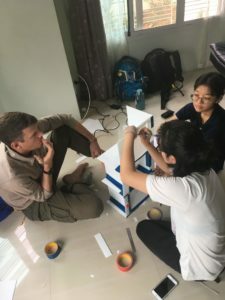 But having the project’s scope and methodology really take form did make it very hard for me to leave the team in Thailand and return to the US for my next semester of classes. Nonetheless, I feel fortunate to have been there to get everything riiap raawy, and I’m eager for my next return to the field this June!